It’s funny you know, pinball machines are a dying breed, yet we had so much fun playing them back in the day before those pesky space invader machines came around. Gottlieb have come to the party now on the PSP with a collection of classic tables that have been around and loved by many. That’s right, this title features actual real life tables, not just simulations of fantasy tables. Gottlieb was the premier manufacturer of tables for an awfully long time and this is a collection of what they considered to be 10 of their best tables of all time. The tables kick off from way back in 1932 and then make their way up. The physics of the game are fabulous and you really get a feeling of playing a real machine. The graphics of the game are top notch and also lend to the realism of the experience. So much so that inevitably you’ll be moving your body around when playing the game and holding the PSP as though that will help you actually move the ball around the virtual table! The title has something that gamers will love and that is the tournament mode that lets you and a friend face off against each other using WiFi and in game sharing mode, only the one UMD is needed. I love this feature of the PSP and think it helps set the console apart from the others. For those of you old skool pinball freaks out there who are worrying about how you jostle the table, there is a nudge function using the analogue stick. It’s pretty delicate though so after a number of attempts and the tilt function going off almost every time, I simply decided that I would not bother trying it anymore. If you are lucky enough to have 7 other freaky friends who love the pinball, you can also play the game with them as well on the proviso to that they all have the game as well. Another neat feature in the game is the soundtrack that features realistic table sounds along with a nice touch bringing background arcade sounds into the mix. I really like it. 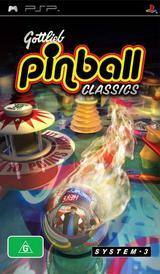 If you are into pinball then this is certainly the title for you so go get it!